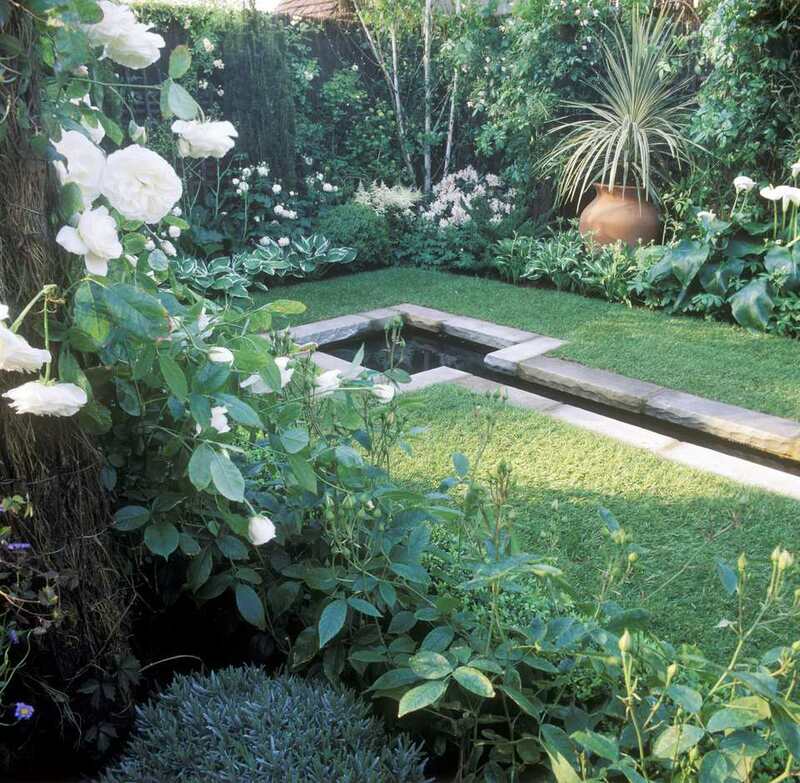 White flowers take the guesswork out of a garden design. Shades of cream, ivory, silver, and pure snow blossoms layer seamlessly to form a peaceful landscape that glows in the evening. White flowers for fragrance, for cutting, and for wildlife will make your garden a respite, no matter your climate. The extreme fragrance of gardenias places many gardeners in love/hate camps. If you fall into the "love" category, know that this plant grows best in warm zones 8-11. Rich, moist, acidic soil is also a requirement for thriving plants. A greenhouse or sunroom is a better choice for overwintering than a windowsill, which usually results in bud drop. Hybridizing efforts have elevated the petunia to from an old-fashioned flower with limited staying power to a powerhouse blossom that bounces back from rain, heat, and humidity. The 'Supertunia' series rarely disappoints, as it requires no deadheading, blooms from spring until frost, and exhibits drought resistance. Use the white with purple veining 'Supertunia Latte' in window boxes and hanging baskets, or enjoy 'Supertunia White,' with their delicate green throats, at the front of your border. White lilies fit many garden designs. Do you prefer statuesque Orienpet lilies like the creamy flowers of 'Scheherazade,' who preen and pout in the dappled sun like six-foot supermodels? Perhaps you adore the supreme fragrance of white Oriental lilies like the 'Casa Blanca,' which will perfume an entire garden on a sultry July night. Or, for those who can't wait to see the first lily blooms of the season, early and perky Asiatic lilies like the pollen-free, solid white 'Tibetan Snow' might fit the bill. For many, white roses remain the quintessential must-have garden flower. And with so many cultivars to choose from, the design possibilities are endless. If you desire a climbing rose, 'White Dawn' offers repeat blooms and disease-resistant foliage. The name of the shrub rose 'Pure Perfume' says it all. 'Moondance' floribunda is just right for containers. 'White Simplicity' is a low maintenance hedge rose that works well in formal gardens. If you're unsure about the returns you will see on biennial plants, give foxgloves a try. Plants produce foliage the first season and bloom the next, but self-seeding ensures that there will always be a blooming generation present in the garden. The new 'Camelot' series, including a gently freckled white variety, has received rave reviews for its strong, upright stems packed with blooms. Hibiscus plants lend a tropical look to any garden, even in USDA growing zone 4. Unlike their tropical cousins, hardy hibiscus plants like the 'Disco Belle White' will come back after a frigid winter, although you may have given up on the plants as they are very late to come out of dormancy. Give this plant ample water and a full day of sun to see its potential. Unlike the florist's azalea that declines a few weeks after blooming, hardy azaleas in the Rhododendron genus may endure for decades. Azaleas like the repeat blooming 'Bloom-a-thon White' prefer mild winters in zone 6 and above and partial shade for best performance. If only all flowers could be as easy and generous with their blooms as cut-and-come-again zinnias. 'Crystal White' is a low-growing variety that will grace your borders with daisy-like flowers through the heat and humidity of summer. 'Magellan Ivory' has layers of frilly petals on compact plants for the patio. Hydrangea arborescens varieties like 'Annabelle' and 'Incrediball' flower on new wood, so even gardeners in zone 3 can grow these easy shrubs with mega blossoms that can reach 12 inches in diameter. Blooms last for many weeks, fading to a pleasing green color as summer progresses. Give hydrangeas light shade and moist soil for the healthiest plants. Whether you want the cheerful poms of 'Tiny Treasure,' the simple daisy-like blooms of 'Cherubino,' or the giant blossoms of 'Frozen,' dahlias can deliver white flowers for cutting in dozens of proven cultivars. All dahlias bloom in mid-to-late summer, but dinner plate varieties take the longest to produce their mega flowers. Removing side blooms will help plants put all of their energy into one or two of the largest flowers. As a plant that tolerates drought and needs very well-draining soil, candytuft Iberis sempervirens is a suitable choice for rock gardens. Butterflies will find the spring flowers a welcome sight on six-inch tall plants that will spread to make a pleasing ground cover in full sun areas. The common Shasta daisy Leucanthemum superbum is named after Mt. Shasta in California, where Luther Burbank worked on hybrids on the plant in the late 1800s. The classic 'Becky' form used to make daisy chains will grace your garden with blooms from July to September, or you can try the fringed 'Goldrush' variety pictured. Every shade garden needs the illumination of white flowers, and impatiens will not disappoint. Busy Lizzy plants will bloom nonstop in warm weather, provided regular irrigation and a light flower fertilizer every two weeks. Plants are easy to start from seed and germinate quickly on a windowsill. Astilbe plants are valued for their ability to tolerate heavy shade, but dry conditions will lead to plant deterioration and death. If inadequate rainfall is a problem in your area, choose Astilbe chinensis like 'Vision in White' over other types, as Chinese astilbes tolerate drought better than most. Jasmine Officinale requires a bit of care to maintain in cold winter areas north of zone 7, but it is worth it for the fabulous fragrance. As a container plant, you can train the vine on a trellis in a sheltered sunny part of the garden, where it will attract hummingbirds and butterflies from spring until fall. In October, bring the plant indoors and keep it in a cool, humid area. Hellebore attracts legions of followers for its large, very early blooms beginning in February on strains like 'Winter Joy Bouquet.' Gardeners with alkaline soil issues will find that hellebores don't mind these conditions, as long as the soil is rich and moist. Annual cosmos flowers look good in any cottage garden and are especially suited to ornamental vegetable gardens, where the plants enjoy the same growing conditions as your tomatoes. The ferny foliage lends texture to cut flower arrangements, so harvest white varieties like 'Sonata White,' 'Purity,' and 'Psyche White' lavishly in June and July, when flowers peak. For gardeners that miss their gardens during the work day, Ipomoea alba is something to look forward to when the six-inch flowers unfurl and release their fragrance at twilight. The sphinx moths that will visit the 10-foot vine in droves add to the entertainment. Phlox paniculata 'David' produces clusters of fragrant white flowers on three-foot tall plants in late summer when not much is happening in many gardens. Phlox plants tolerate deer and black walnut trees, the nemeses of many rural gardeners. Purple allium flowers from spring-blooming bulbs have grown in popularity in recent years, but the lesser known white cultivars like 'Mont Blanc' are also worth seeking out. Although allium blooms only last for about two weeks in the garden, the green seed heads are attractive for at least a month afterward. ​Good drainage is essential to growing healthy peonies, which can succumb to a variety of rots and wilts in soggy spring soil. Gardeners who employ raised bed gardening techniques will find the softball-sized blooms of white varieties like 'Bowl of Cream,' 'Dr. F.G. Brethour,' and 'Nick Shaylor' to be worth the extra labor. Persian buttercup flowers are prevalent in wedding flower arrangements, but the flowers are very particular about their needs before rewarding you with blooms: excellent drainage, cool weather, and a growing zone of 8-10 ​are most desirable. If you don't live in a Mediterranean climate, buy plants already in bloom at your local nursery, and enjoy them for a few weeks on your windowsill. As a member of the nightshade family, flowering tobacco plants are at their most fragrant in the evening. The white tubular flowers make a statement in the back of the border on five-foot plants from June until ​the first frost. Some afternoon shade will encourage plant vigor in hot, humid areas. The tiny white flowers of 'Sweet Autumn' clematis have gotten mixed reviews from gardeners frustrated with the vine's invasive qualities, but clematis 'Snow Queen' and 'Candida,' which bloom on both old and new wood, are much better behaved. If you are impatient for blooms on bare root plants, remember the adage: "The first year they sleep, the second year they creep, and the third year they leap."